Mounting a wall-hung toilet needn’t be daunting with a strong and stable system that is also super-easy to fit. The GROHE Rapid SL 3-in-1 installation set for wall-hung toilets fits the bill perfectly. The steel frame is certified to hold loads of over 400 kg for ultimate stability and it can be installed in front of a solid wall or inside a stud wall in next-to-no-time thanks to the GROHE QuickFix system, which requires no tools to connect hose, inspection shaft and water supply. With a low height of only 0.82 m, this system can even be installed under windows. The GROHE EcoJoy dual flush system is kinder to the environment, reducing water consumption by up to 50%. Noise transmission to the building is kept to a minimum thanks to GROHE Whisper technology, engineered with low-noise fittings and separate plumbing. The set comes with an attractive Skate Cosmopolitan chrome flush plate. Thanks to low-noise fittings and decoupled piping, the GROHE Whisper technology prevents any sound transmission to adjoining rooms, leaving the other occupants of the house undisturbed. Undercutting the standard requirement of 24 dB(A), this system's low noise level of only 21 dB(A) was confirmed by Germany's renowned Fraunhofer research organization. The Rapid SL stud wall installation even reached a low-noise record of 14 dB(A). 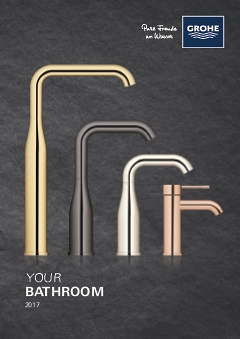 The GROHE EcoJoy flush technology reduces your water consumption by up to 50%. The dual flush system provides two buttons, allowing you to select a flush volume of either 3 or 6 litres (or 3 and 4.5 litres, depending on the ceramic body). Using the small button on the flush plate, it is also possible to stop a full flush prematurely. Flushing a toilet effectively can be a challenge in buildings with old plumbing. The SpareFlush system provides a solution to this problem: in addition to the regular 6-litre flush volume (or 4.5 depending on the ceramic body), it provides an extra volume of 3 litres, ensuring an effective flush, even with old plumbing. Connecting the system is super easy with our ToolFree concept: no tools are needed to connect water supply, flexible hose and inspection shaft. The GROHE QuickFix concept ensures flexibility and ease of installation, cutting installation time significantly. The Rapid SL system scored top marks in a practical test carried out by Germany's REFA association, outperforming competitors by up to 155% with respect to the time taken to complete the installation. Safety is the name of the game with your GROHE installation system. The dimensional stability and load-bearing capacity of the steel frames were tested and the Rapid SL installation systems for wall-hung toilets and basins were certified to hold over 400 kg and up to 150 kg, respectively. The universal base plate matches all our flush plates, allowing you to choose from over 130 attractive designs. All flush plates can be mounted either horizontally or vertically, even without tools, as the inspection shaft can be installed both ways. Connecting drain valve and flush plate is super easy with our EasyConnect system. No need for tedious measuring or cutting the hose down to the right length. The pneumatic hose simply plugs onto the other elements. Smart and easy. Save time with a VarioPort water connection: irrespective of position of the supply pipe, the supply hose can be attached at four points: front, rear, left or right. With a single drain valve for all flush modes – single or dual flush, start-stop technology – mounting the installation system is simple and hassle-free, leaving no room for mistakes. First-class installation system offering superior functions and features.